The Next Stage: Women and Retirement: One of the best things about book discussions/ readings about Feminism in Philadelphia is meeting some of the women featured in the book. One of the best things about book discussions/ readings about Feminism in Philadelphia is meeting some of the women featured in the book. One of the best things about book discussions/ readings about Feminism in Philadelphia: The Glory Years, 1968-1982 is meeting some of the women who were featured in the book. Recently at an event at Watermark Retirement Community, I met Sharon Wallis, a key figure in 1970’s feminist movement in Philadelphia, and at a reading at the Cosmopolitan Club I met Philadelphia NOW’s first treasurer Pat Corboy. Pat said she really regretted not having played a greater role in Philadelphia NOW but that she was struggling to establish her career in finance—-a field with very few women in senior level positions. Her comment made me realize that being active in the movement was not the only way to advance a feminist agenda. Women like Pat Corboy were trailblazers in fields once closed to women and their success must certainly have inspired other women to pursue non-traditional careers. That’s another book I hope someone will write—-Philadelphia’s trail blazers in non-traditional careers! 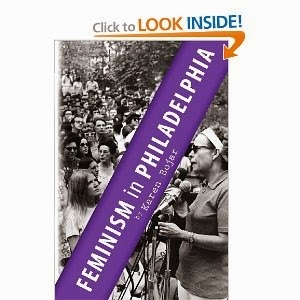 Feminism in Philadelphia is now available in a kindle edition.